Columbia Lake Provincial Park is used in summer by windsurfers, paddlers (canoeists and kayakers), and motorized water craft. The 2,758 hectare lake is the largest warm water lake (18°C in July) in the East Kootenay. Approximately 3 km of undeveloped beach area allows for non-consumptive recreation opportunities (wildlife viewing, paddling, nature appreciation). Fishing on Columbia Lake is popular year-round (favoured sport fish are mountain whitefish, burbot, kokanee, rainbow trout, bull trout and cutthroat trout). The wetland/marsh component of the park offers excellent opportunities for nature appreciation, viewing and photography. The upland areas are largely pristine and provide a panorama of exceptional scenic value, particularly east towards the Rocky Mountains. Hiking and mountain biking are also common in the upper grasslands on derelict logging roads and along the park access road. Please Note: This park is user maintained. The park provides one of the few good public access points on Columbia Lake. The undeveloped, pristine lakeside setting offers recreation opportunities without high volumes of people. Alternative locations on Columbia Lake (such as Tilley Memorial Park) possess a high level of facility infrastructure and lack the undisturbed natural shoreline/upland characteristics evident at Columbia Lake Provincial Park. The park is an excellent staging area for hiking and biking opportunities along the entire east side of Columbia Lake. Currently, frontcountry parks, such as Columbia Lake Provincial Park represent less than 1% of the land area in the Columbia Valley. Sport fishing on Columbia Lake is a popular year-round activity. The park does not have a boat launch. There is a boat launch at Canal Flats. A well-developed 400 M long hiking / biking trail allows access to the lakeshore. Columbia Lake Provincial Park is located in the Columbia Valley of south eastern British Columbia approximately 2 km south of Fairmount Hotsprings and 3 km east of Hwy 93/95. The 257 hectare park lies on the eastern shore of Columbia Lake. Access: Turn off Hwy 93/95 at the Fairmont Creek Road (across from the Riverside Gold Resort). Travel east for 0.4 km. Turn right on the Columbia River Road. The park is located 1.6 km south along this gravel road. Mountain biking opportunities exist in this Park, both on trails and on the access road. Bicycle helmets are mandatory in British Columbia. Fishing on Columbia Lake is popular year-round (favoured sport fish are mountain whitefish, burbot, kokanee, rainbow trout, bull trout and cutthroat trout). Anyone fishing or angling in British Columbia must have an appropriate licence. 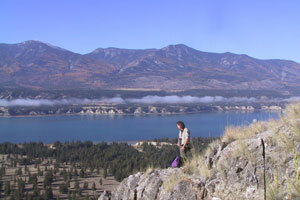 The park is an excellent staging area for hiking opportunities along the entire east side of Columbia Lake. For your own safety and the preservation of the park, obey posted signs and keep to designated trails. Shortcutting trails destroys plant life and soil structure. This park allows swimming possibilities in the 2,758 hectare lake, and is the largest warm water lake in the East Kootenay. There are no lifeguards on duty at provincial parks. Approximately 3 km of undeveloped beach area allows for non-consumptive recreation opportunities (wildlife viewing, paddling, nature appreciation). The wetland/marsh component of the park offers excellent opportunities for nature appreciation, viewing and photography. The upland areas are largely pristine and provide a panorama of exceptional scenic value, particularly east towards the Rocky Mountains. There are windsurfing opportunities at this park. The park is open for day-use possibilities, but there are currently no day-use facilities in the park. The undeveloped, pristine lakeside setting offers recreation opportunities without high volumes of people. Alternative locations on Columbia Lake (such as Tilley Memorial Park) possess a high level of facility infrastructure and lack the undisturbed natural shoreline/upland characteristics evident at Columbia Lake Provincial Park. Some facilities and hiking trails in the park are wheelchair accessible. There is no wheelchair access to the water.